In May I found out I’d be working from home, which has turned out to be a great thing and I feel like a more productive human being now. The challenge was to create a space that wouldn’t interfere with our home life and would also be peaceful and inspiring. We had this crappy little room that ended up being the perfect size and place since it has a separate entrance off the patio. Rob worked so hard to get this together for me and here’s what it looks like now! 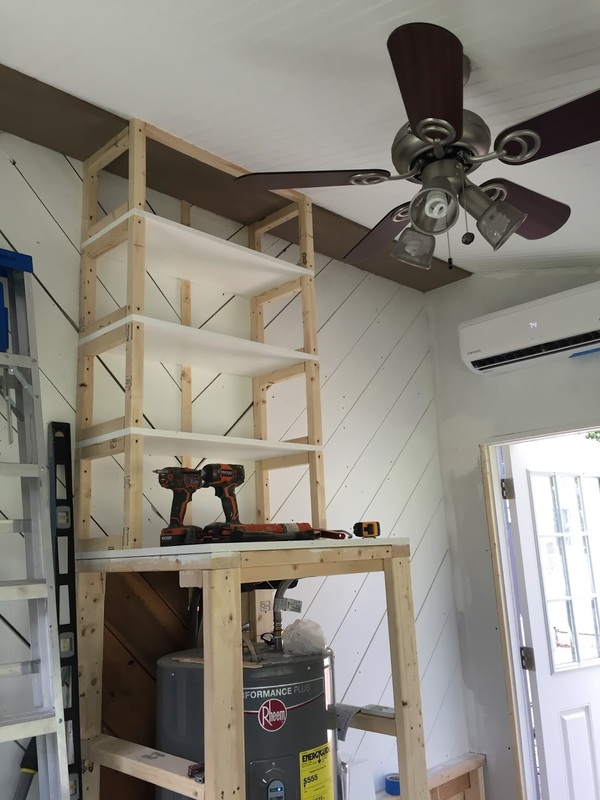 Rob built a cabinet and shelving unit to house and hide the water heater. This also adds extra storage for supplies, etc. On one side of the room where there used to be some shelves and a dirty old window, I wanted a cozy corner for when I don’t feel like being glued to the desk. This is the perfect chair to curl up with the laptop. It’s so exciting to have this project finished because I was so worried about feeling displaced and not being able to separate work and home life. Now it won’t be an issue anymore and this is a quiet spot to concentrate and get stuff done. It took a lot of work and as always with this house, there were problems that arose which we weren’t expecting, but all in all, we’re both really happy with it. Home sweet office! The State Of The Office: Progress! So, I’m officially working from home, following some vacations and much needed time in the wilderness. Work on the office continues and for now I’m happily set up at my desk in our dining room, but am excited for the day when I don’t have to worry about the cats knocking all my papers on the floor or the dog starting to bark just as I’ve dialed into a call (I swear she has ESP and does this to spite me because she knows I prefer cats). As with every project we’ve done in this house, there were special challenges that had to be dealt with. 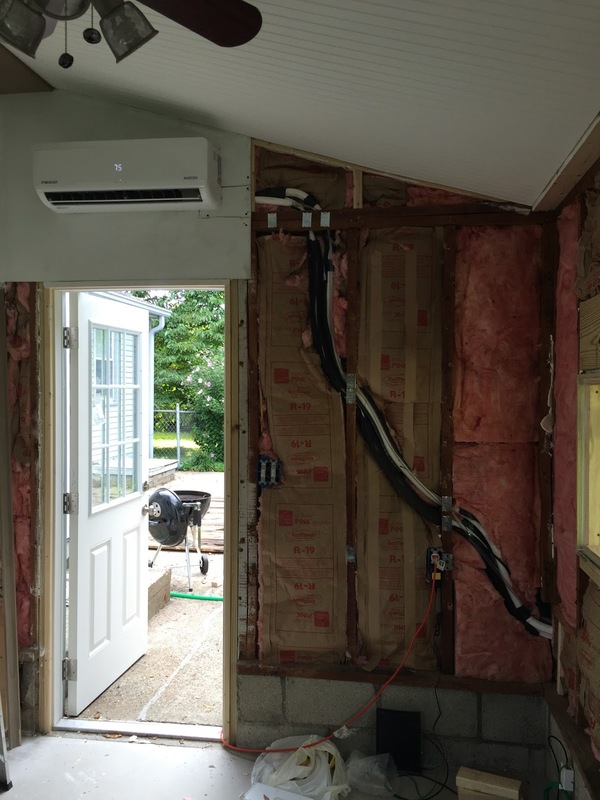 One of these was the installation of a mini split heating and cooling unit we purchased. Online, the reviews for the unit were great. 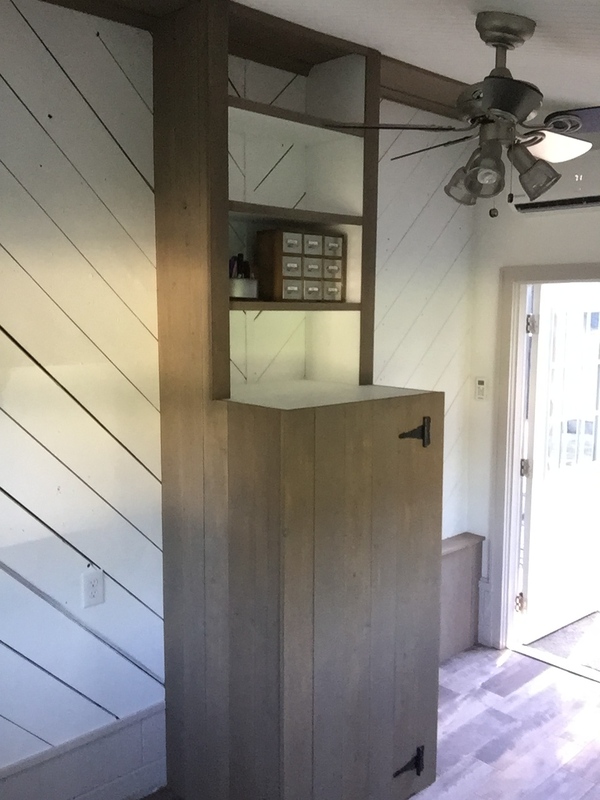 People loved the efficiency and “easy installation” along with the fact that the price of the unit was about $500 less than the ones being sold at Home Depot. However, these things are TRICKY as hell to install, plus most HVAC places will not install a unit that you didn’t purchase from them. So that was fun. Rob did his best until finally we were able to find a guy who had worked on a home just down the street from us. $400 later, our unit is in working order and I will hopefully not die from a gas leak in the copper lines. Lesson learned. Mini split installed, plus a new door too…with a window in it!!! Another big piece of this room (literally) was the new window. We ordered the window way in advance of when it would have to be installed and instead of three weeks, it took five and a half to come in. Once it arrived and we stopped pulling our hair out, we got right to work. Basically, we took two tiny 22 inch windows and combined them to make one nine foot by 24 inch window that looks out on the back yard. 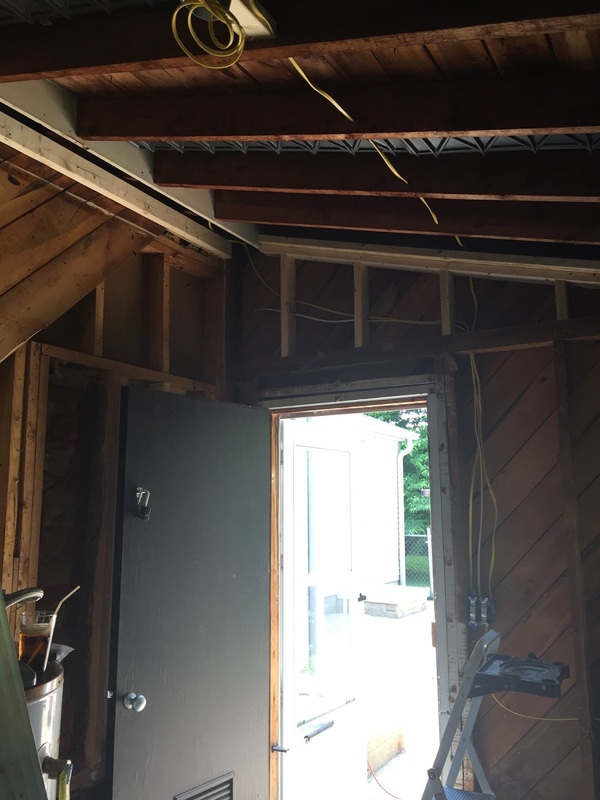 Rob cut the beams in preparation for a header and then used a sawzall demo blade to cut through old asbestos shingles and aluminum siding (he wore a mask). Both of us hefted the window outside after the raw edges of the house had been sealed with a tar tape to prevent any moisture getting in. The result is this awesome new visage to the green outdoors that adds some natural light to this tiny, dark space. Then all the old insulation (or lack thereof) was torn out and replaced with fresh new pink stuff. 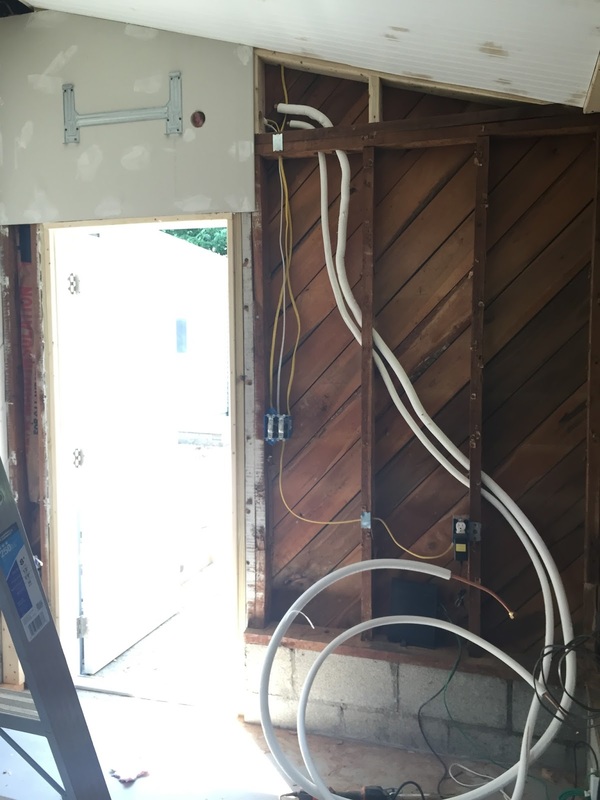 Drywall is now up and Rob is working on a shelving unit that will house and hide the new, smaller water heater plus provide additional storage space for office supplies. To be honest, I’m pretty freaking thrilled about where things are right now. There is a lot of painting to do and we still have to put the tile floor in once that’s finished, but there is light at the end of the tunnel! This room is totally unrecognizable from what it was before and even though this most likely is not a project that will add significant monetary value to our house, it is the perfect space for what I need at this point with my job and I’m so very grateful that we are not having to convert our guest room to an office. Now fingers crossed that all the furniture will fit! This was another busy weekend for us in trying to get the home office a little further along. Thank goodness for breaks with friends that included margaritas and nachos. A few important things are finished now. The room has been rewired, so there are a couple extra outlets and the connections are much safer now so we won’t all go down in a blaze. 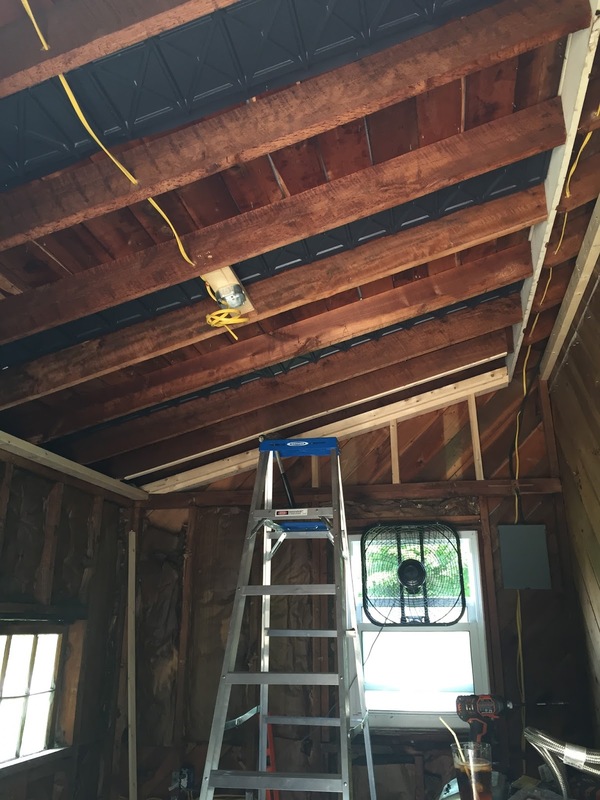 Rob also purchased 2x4s to structure the side wall and ceiling beams since we’re dealing with a bit of a wonky mess up there. 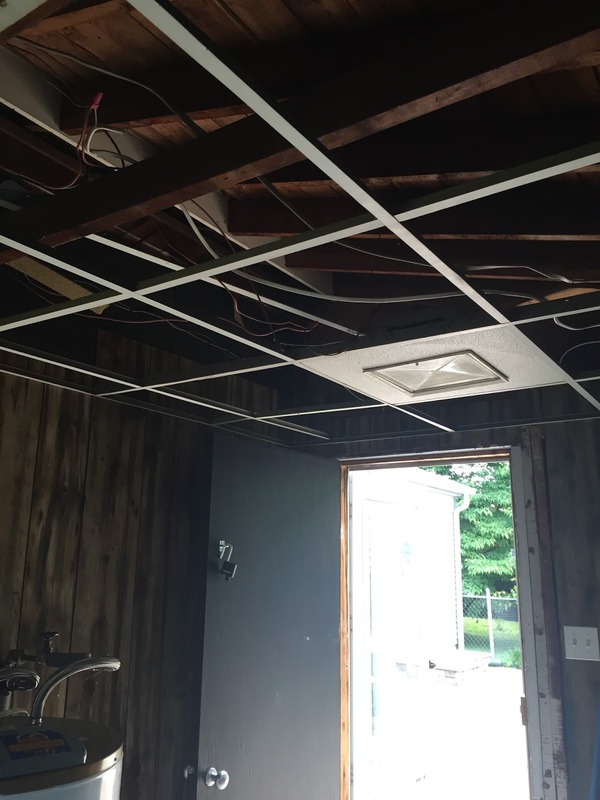 Baffles were also added for ventilation before the new insulation was put in. I have no idea how all this stuff works and why it’s so complicated to just stick some pink fuzzy stuff up in some beams, but apparently air flow is a big deal. 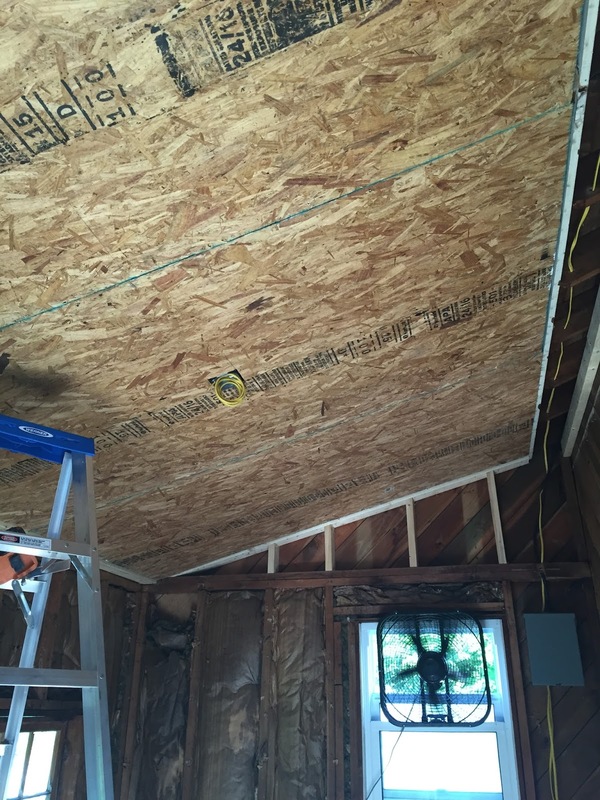 The insulation process went pretty quickly, and once all of that was in, we were ready for the boards that will eventually be the base for the bead board ceiling panels. 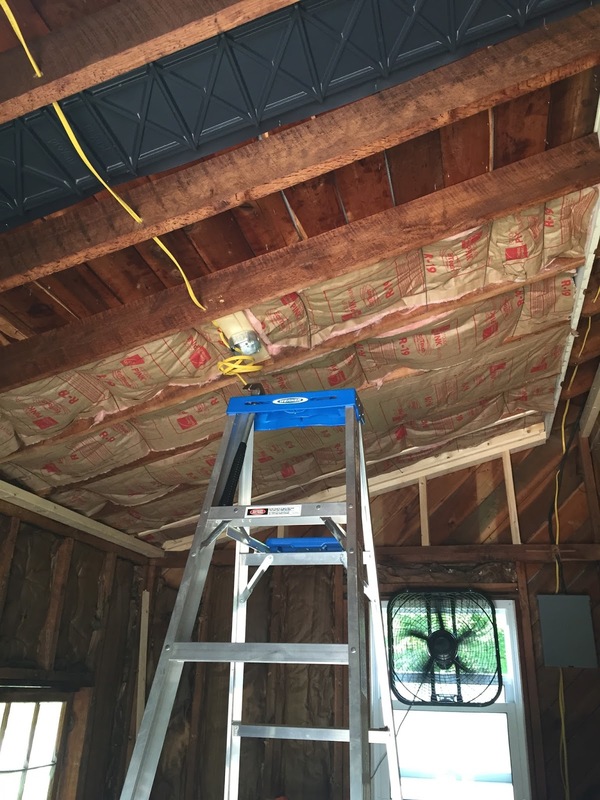 Three big heavy boards were added on top of the insulation and rafters. Rob added a ledge that we were able to rest each board on while he put the screws in, which sounds really easy, but I’m thankful nothing fell on us and we weren’t squished in a tragedy with a headline that read, “Couple is Crushed In The Last Of One Too Many Renovation Attempts”. It looks really great! 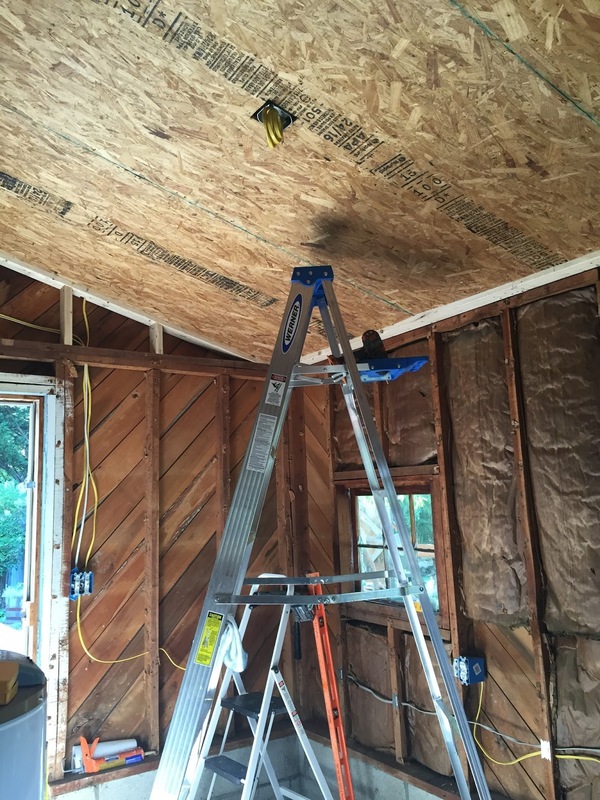 I can’t believe there will be a real ceiling in this room. 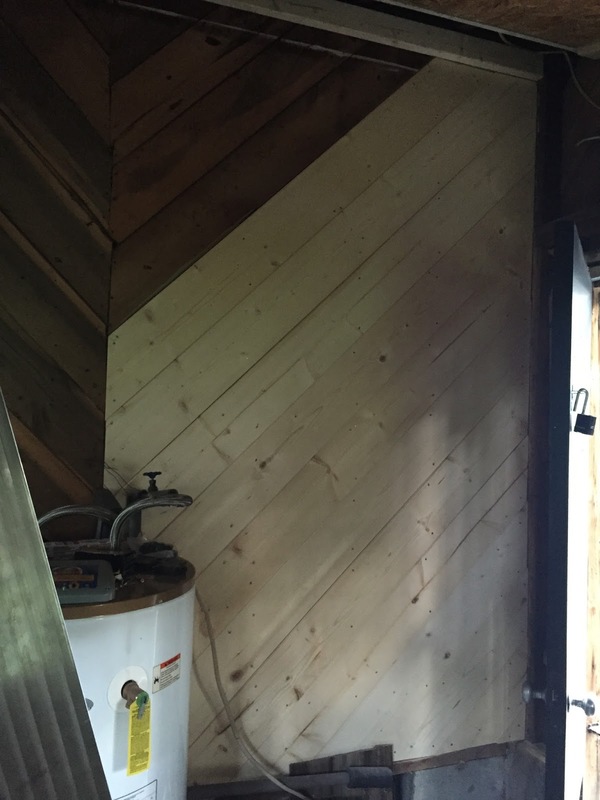 The wall adjacent to the back pantry has some really pretty old pine boards on a diagonal slant that I want to leave as is and throw a coat of paint on. In one half of the wall it looks like there was an opening for a door at one point, so we purchased pine boards to finish that off so both sides are equal. So there you have it, a weekend’s worth of sweat, alcohol, and the fervent wish that we could just wiggle our noses and blink this room into being. The good thing is we’re both about to get a break. Rob is going to visit family, while I head up north to Canada (EH?!) with a friend for a much needed respite from life. I’ll be blogging from there about (aboot!!) our adventures if the promised wifi actually works. Just shoot me, you guys. 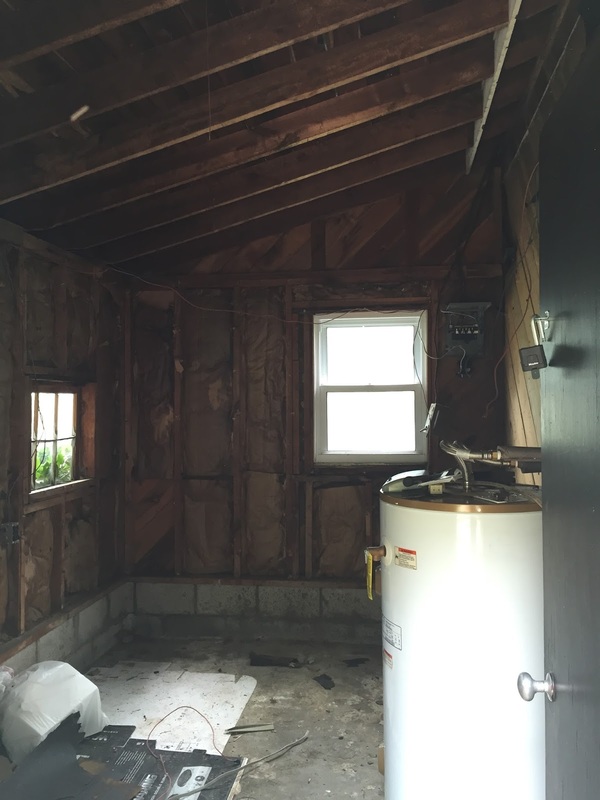 We are neck deep in another home reno/remodel. It’s been ages since I’ve posted anything because stuff has been happening and I got overwhelmed and lazy. So basically, the long and short of is it that our landlord sold our office building and the four us in that building are making the transition to working from home. There are a number of things about this that make me really excited, like not having an hour commute anymore. And there are some things that I’m still not sure about, like seeing the women I’ve grown to love and adore working with everyday. We’ll figure it out and have staff meetings, but things are changing and we’re rolling with the punches. 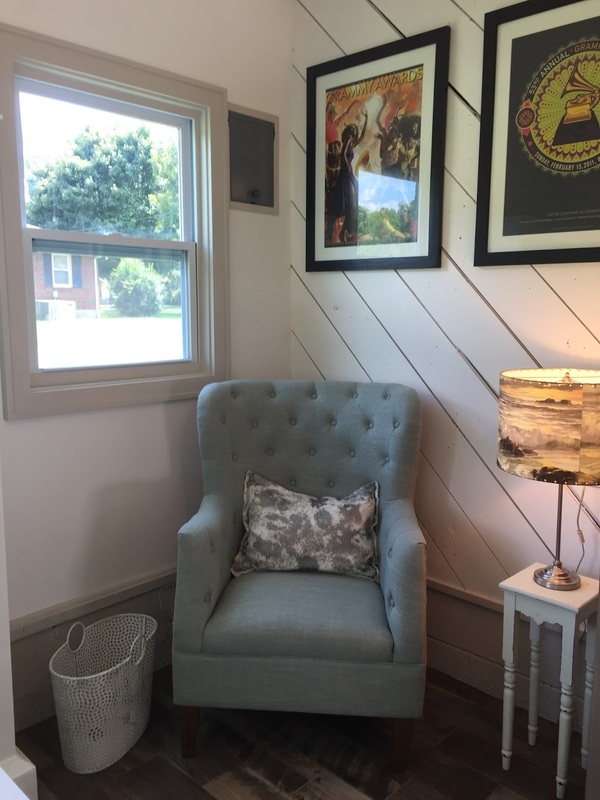 There’s a room off of our patio that has its own separate entrance, which makes it kind of ideal for an office space, giving it that feeling of separateness while still being attached to the house. However, it’s disgusting. Our water heater lives in this room, along with spiders and icky things. The room isn’t climate controlled and it’s a dark little hole. The idea is that we’ll remove the drop ceiling, pour a new concrete floor and add tiles, add a mini-split heating and cooling system that can hang on the wall, open up the wall and connect the two tiny, rotting windows to create one long picture window that will look out onto the garden, and re-insulate the walls and ceiling prior to hanging drywall and bead board. So when we removed the ceiling tiles, the first thing we noticed was a mess of wires that looked like they were about to set the place on fire. It astounds me how utterly messed up aspects of this house were. The little place has strong bones and a great structure, but the previous owners effed up every project they did on this place. That’s the nicest way I can say it. Effed. We’ll add rewiring the room to the list. 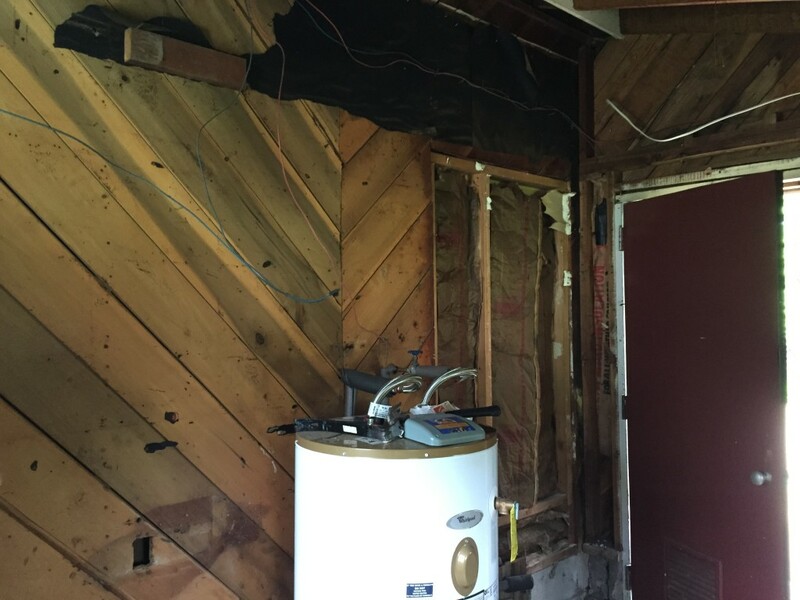 The water heater has to stay, so Rob is going to build something around it that will cover it up and perhaps add some shelf space to the room. 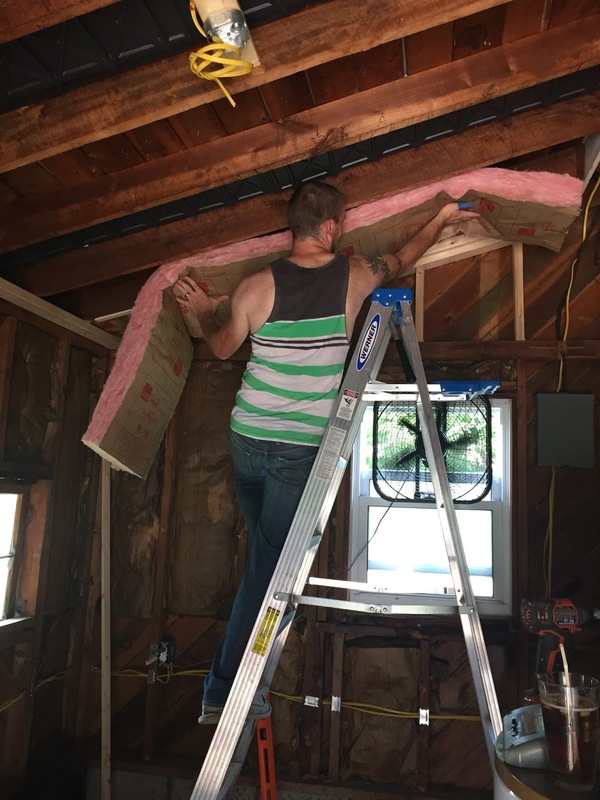 When we tore the paneling off the walls, we discovered that they ran out of insulation and decided that instead of purchasing more insulation, it would make more sense to nail cardboard boxes to the wall. CARDBOARD BOXES. Kotex and toilet paper boxes. Seriously. There is a lot of old insulation in the walls that is just falling to pieces, so we’re going to remove and replace that. I can’t even describe how nasty it is. I feel the need to buy a hazmat suit. 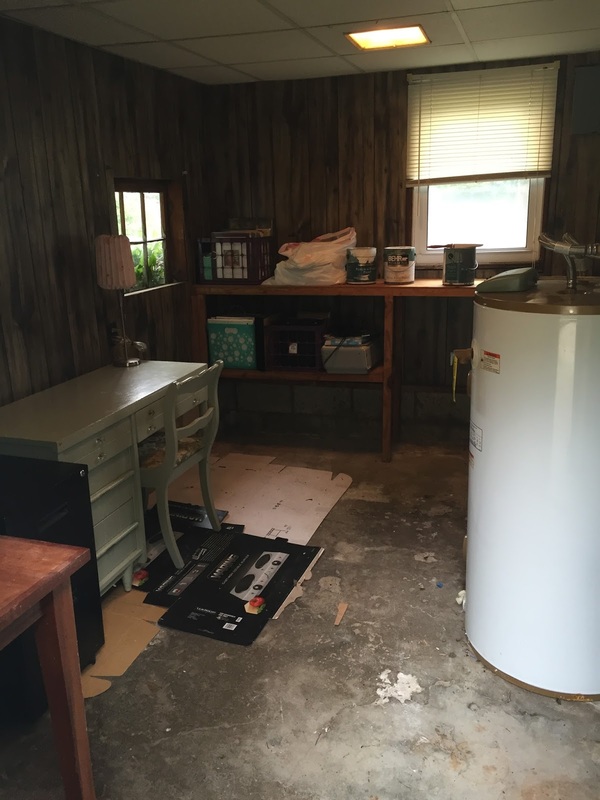 It seems like this room must have been an addition at one point since it’s on a slab and the wall behind the pantry looks like it was an exterior wall. I don’t want to cover it with drywall because there are some cool looking boards that would look really nice if they were painted a nice bright white. 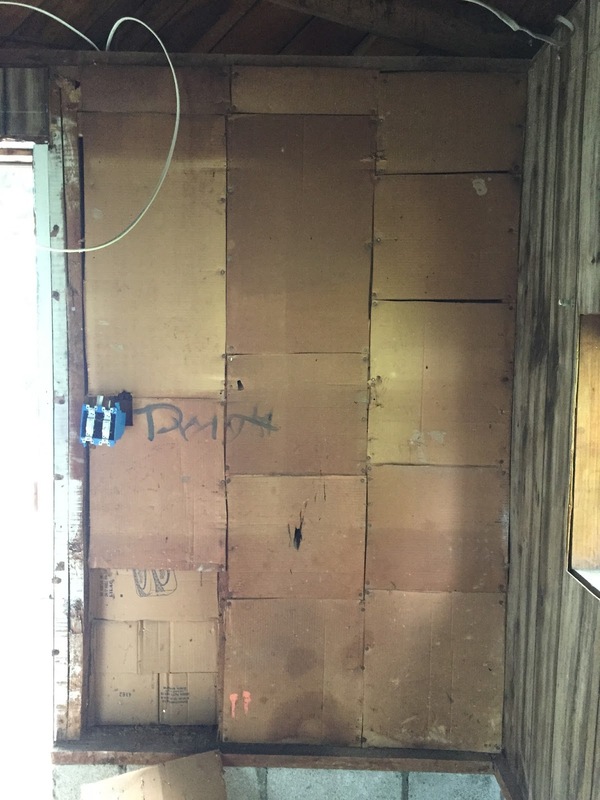 However, because nothing is easy, we discovered that a doorway had been cut into that wall long ago, so we’re going to have to replace those boards with rough pine. We’re leaving the ceiling at an angle because it makes the room feel so much bigger. 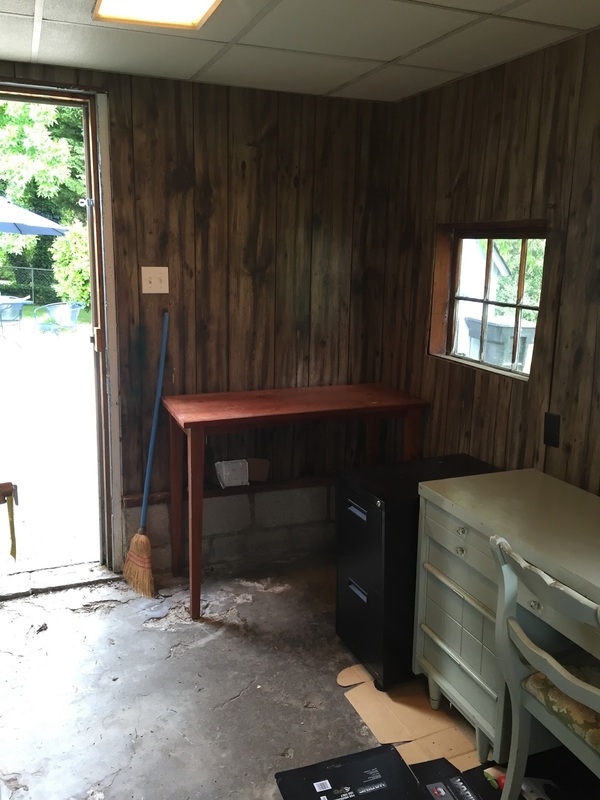 The entire space is 12’x8′, which is small, but a good size for an office. I think it’ll eventually be a nice little space, but for now, we have a lot of work to do. 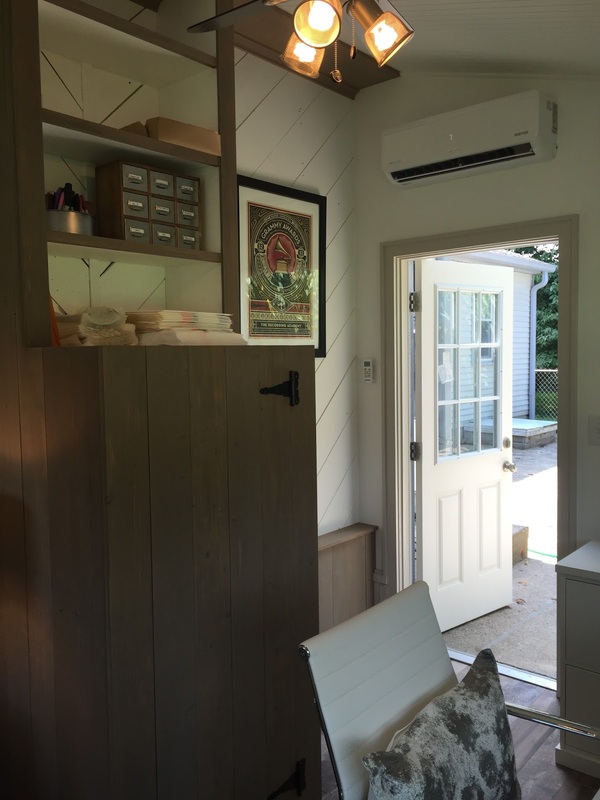 I’ve been scouring the internet for pictures of home offices just to get ideas and I will tell you this, none of them have a big old water heater in them. So here we are, in the middle of it all…just living the dream.